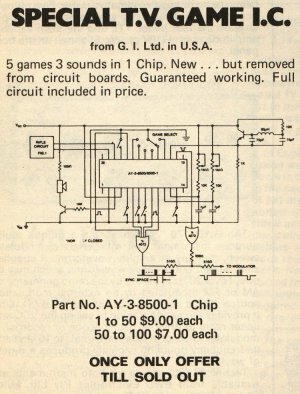 In this page, you will find several schematics of commercial PONG systems sold at the end of the 1970s. 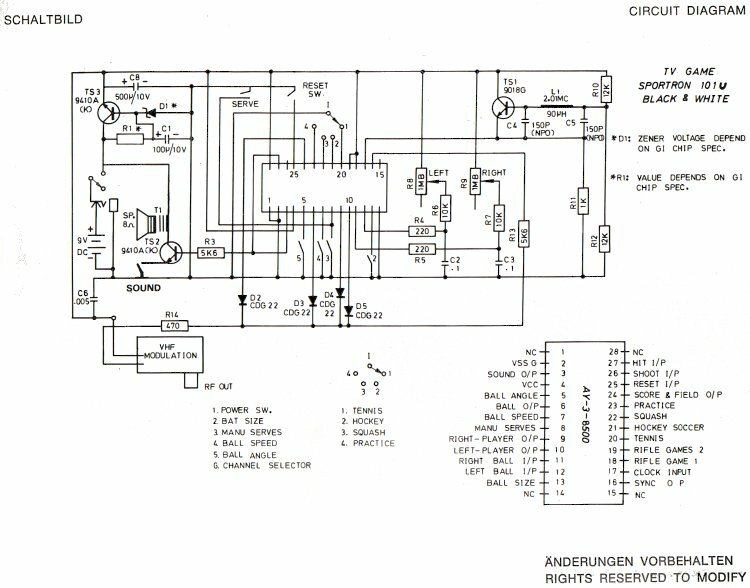 Other schematics are available in the electronics magasines articles page. They are generally much more interesting for those who want to understand the real operation of early PONG systems. This is a german version of a very common european system. 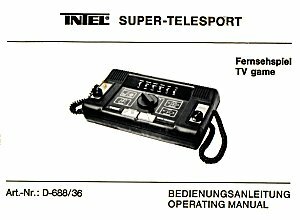 It was released by numerous manufacturers such as Sportron, Asaflex, Univox, Interstate and others, and exists in two versions: 4 and 6 games. The case can be black or white and the controllers can change. This system was released in 1977 and uses the AY-3-8500 chip grom General Instruments. 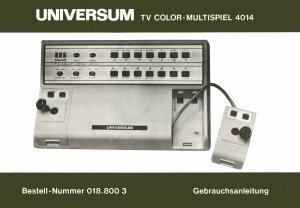 This german system is very uncommon as it uses two game chips: the AY-3-8610 (10 PONG games) and the AY-3-8760 (4 motor-cycle games). 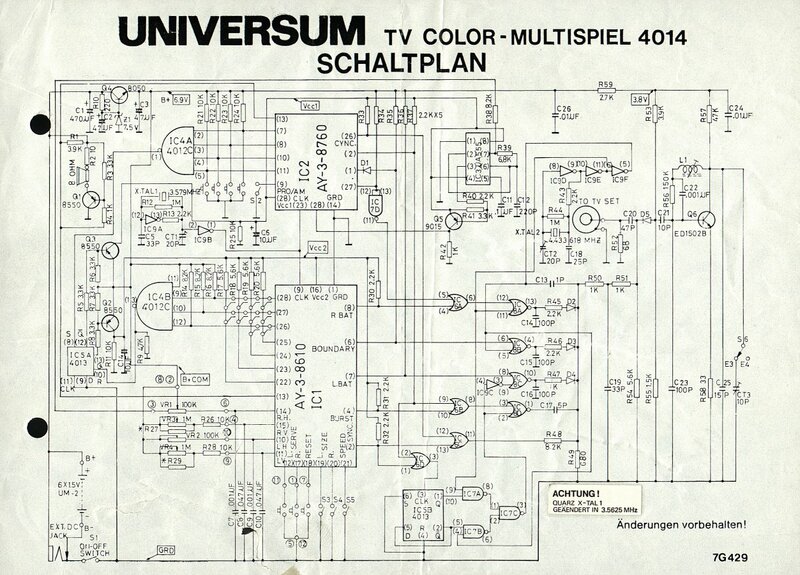 The schematic is quite big. Several other manufacturers used the same apparatus (same chips): Ingersoll, Creatronic, and even Atari). 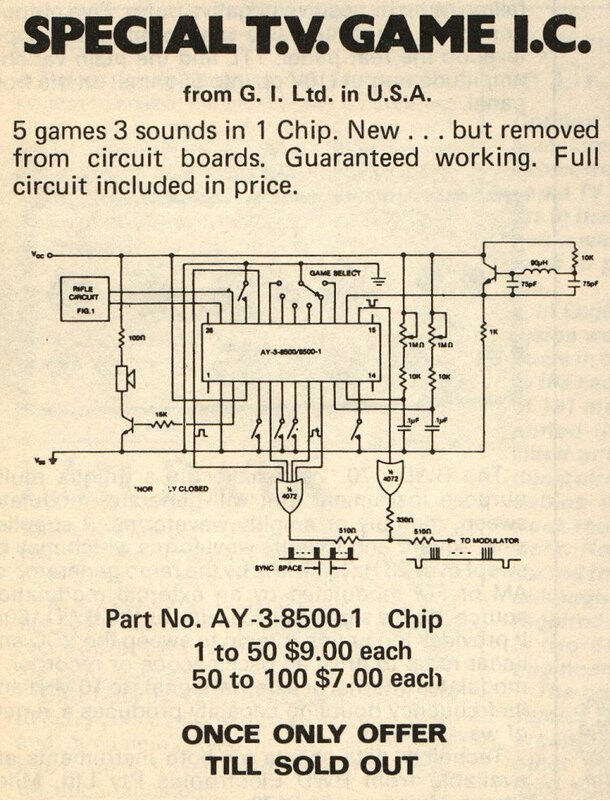 Just a simple advertisement for the AY-3-8500 game chip from General Instruments (Electronics Today International magasine, november 1976). Rather than selling a complete kit, XENON proposed only the chip at very low price (the stock was a pull-out from electronic boards), and gave the complete schematic to make a working system (which uses a minimum of components).